Danish rabbi and author; born in Copenhagen March 17, 1853. He studied at the Von Westenske Institut in his native city, at the same time receiving private instruction in Talmudics and Hebrew literature. In 1874 he was awarded a prize for a treatise on Arabic philology. From 1874 to 1879 he studied at the rabbinical seminary at Breslau; and on passing his examination he received offers of tutorships successively at the Breslau and Ramsgate seminaries, which he declined. A few weeks before he was called to Copenhagen as assistant to Chief Rabbi Wolff, being the first Danish-born rabbi of the Copenhagen congregation. At Wolff's death (1891) Simonsen was unanimously chosen his successor as chief rabbi of Denmark; he resigned his office in 1902, on which occasion King Christian IX. conferred upon him the honorary title of professor. He is a member of the executive board of the Alliance Israélite Universelle. 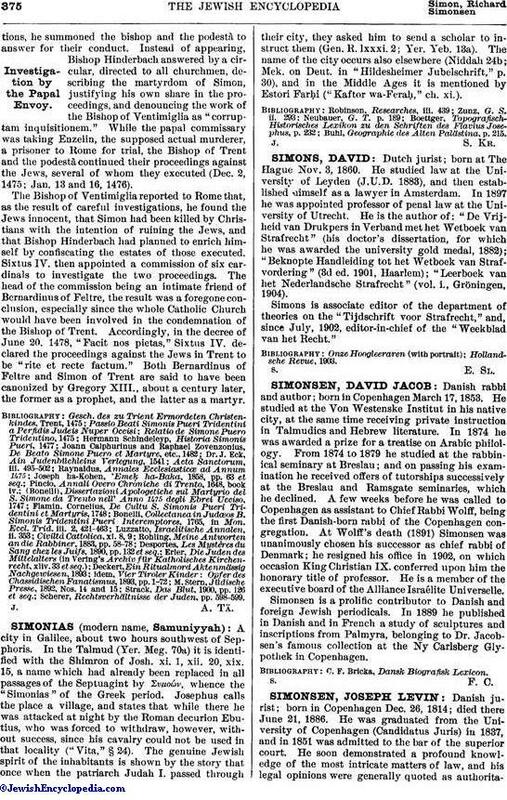 Simonsen is a prolific contributor to Danish and foreign Jewish periodicals. In 1889 he published in Danish and in French a study of sculptures and inscriptions from Palmyra, belonging to Dr. Jacobsen's famous collection at the Ny Carlsberg Glypothek in Copenhagen.